Last weekend was Cyclevision. It's an event for recumbent cyclists, including an exhibition, social rides, racing and much talking over a weekend. I worked on the Sinner stand on Saturday. We had Wilfred's spectacular Mango+ on the stand for customers to see, and it got a lot of attention. Also I got to see Peter racing. On the Sunday I took part in the six hours race. As ever, the leaders were much quicker than I am. The winning rider, Ymte Sijbrandij, rode more than 322 km in six hours and averaged over 53 km/h. 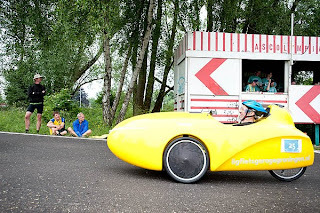 He's always very quick, but this time he also had a "secret weapon" - a super lightweight version of the Quest velomobile, differing markedly from those you can buy, with a custom carbon frame not adjustable for other riders, and fitted with a racing hood. Indeed, the first six places were taken by machines which were not standard or not road legal (that's perfectly OK - it's a race). I took 21st place out of 54 participants, covering 235 km in six hours, in the same Mango as I ride to work. My average speed was 39.1 km/h. I didn't come close to a podium place, but I'm still very pleased with my result. My first two hours went well, averaging over 42 km/h. I covered 100 miles (i.e. 161 km) in three hours and fifty four minutes, and still had an average above 40 km/h at the five hour mark (200 km covered before five hours). However, I really ran out of steam in the last hour. It became increasingly difficult to eat and drink, leading to low blood sugar and general grumpiness, and my average speed dropped a lot. 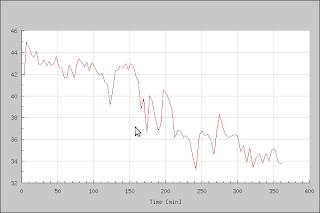 You can see it in the graph of speed over time. At this time quite a few people I'd overtaken earlier took laps back from me. I also took part in Cyclevision in 2002 and 2003 when the long race was three hours in length. In 2002 I covered 97 km and in 2003, 95 km. 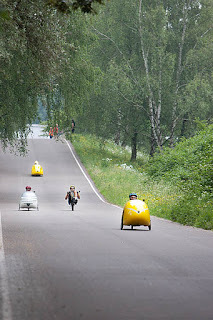 These are average speeds of just 32.3 km/h and 31.6 km/h. This year I was about 30% faster for the first three hours, and 20% faster over the entire six hours than I was when I was eight years younger, in a race which was half as long and on a track which didn't include a bridge. A good part of the difference can of course be put down to the Mango's aerodynamics. It simply goes much faster for the same amount of effort. However, in this case the difference in speed is greater than you'd expect between the two bikes meaning that I'm somewhat fitter now than I was eight years ago. I put that down in large part to living in the Netherlands. I always thought I cycled a lot when I lived in the UK, but in this country the environment invites you to cycle more than you would otherwise. Last year in the four hour race at Tilburg I had a puncture which took ages to fix because I had no spare parts with me. As a result, this time I carried a pump, spare tyre and inner tube. I also still had my trailer hook attached to the Mango, the basket I carry things in next to my seat, speakers and in fact almost all the stuff I usually have. I didn't really do any training. I've heard that some trainers refer to cycle commuting as "junk miles", but I still think the 60 km round trip commute must count as something. Apart from that, just the occasional Sunday huneliggers ride, and the elfstedentocht. Peter also wrote up the ride, including a video with the camera pointing the other way. Harry made a video of a camera test with the Mango Sport and Marjon made one from next to the start line. Many more photos, videos and blog posts can be found on ligfiets.net. Thanks to the organisers, time-keepers, marshalls and other volunteers who gave so much of their time to make the event go so well, and also to the other competitors who were such fun to race with. My speed this year in the six hours race was nearly so fast as that over just one hour in last year's cyclevision. I'm really pleased ! I took the two photos from Bas de Meijer. I hope he doesn't mind. Thanks for a great bit of video. The shots of the various riders makes for deeper interest than I had expected. I wonder if the six-minute man would gain more speed if he bounced less in his seat. Very impressive collection of racers. My hat is off to everyone who can ride for six hours! Ditto both the above posts - great post & video David. I followed the link to the pic of Wilfreds Mango+ too which is on another level! Good effort! Remember the mantra: "Drink every ten minutes; eat every twenty"!